Windows 10 users: Zendesk recommends using Ubuntu for Windows 10 as your apps development environment. Ubuntu is an open-source Linux operating system you can install in Windows 10 from the Microsoft Store. For installation instructions, see Setting up a Bash shell in Windows 10. See the known issues if you run into any problems installing or using the tools. If you're just starting out building apps, see Building your first Zendesk app, a five-part tutorial series that teaches you how to build an app from start to finish. This section describes how to open the default command line interface of each operating system. In macOS, you can run ZAT commands using Terminal, which is a Bash shell. Double-click the Terminal application in your Applications/Utilities folder. In Ubuntu for Windows 10, use the default Bash shell to run ZAT commands. Open the Windows Start Menu, type cmd in the search box, press Enter to open the command prompt. The bash shell opens after a moment. ZAT is a Ruby gem -- a self-contained package of Ruby code that extends Ruby. You don't need to know Ruby to use the tools but you do need to install Ruby to install the gem. ZAT supports Ruby 2.1 or later on Mac and Ubuntu, and Ruby 2.3 only on Windows. If you get an error, Ruby is not installed. If the result is a Ruby version earlier than 2.1, you'll need to update it. If the result is Ruby 2.1 or better, you don't need to do anything. Skip to Installing the ZAT gem. Important: Zendesk can't provide support for third party technologies like package managers and Ruby installers. If you run into trouble, try searching for the error message in Google. User forums provide the answers to most Ruby questions. Ruby is included with all modern versions of macOS (10.9 and later). If you have Ruby 2.1 or later, you can skip this section and go to Installing ZAT. If you need to update Ruby, see Managing Ruby versions. Ruby is included with Ubuntu for Windows 10. If you have Ruby 2.1 or later, you can skip this section and go to Installing ZAT. ZAT only supports Ruby 2.3 for Windows because Ruby 2.4 and later has a dependency issue that prevents ZAT from working. Earlier versions of Ruby are not supported. As a result, consider using Ubuntu for Windows 10 as your development environment. For installation instructions, see Setting up a Bash shell in Windows 10. If you decide to use Ruby 2.3 for Windows, make sure to install the Ruby Development Kit (DevKit) after installing Ruby. See the downloads page on the RubyInstaller site. Note: If you're using macOS or Ubuntu and any of the following commands complains that you don't have write permissions for a directory, start the command with sudo to request admin privileges, then enter the password for your system when prompted. Example: $ sudo gem install rake. The ZAT gem and a number of supporting gems are installed, along with related documentation. You can automatically create basic starter files and folders for a new app. In the command-line interface, navigate to the folder where you want the app files to be saved in a subfolder. 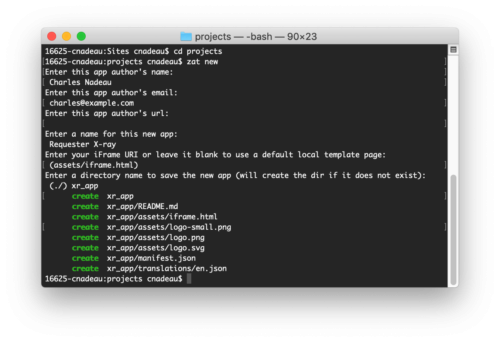 The command creates a set of starter files to use with the Zendesk Apps framework v2 (ZAF v2). To learn more, see the ZAF v2 documentation. See the app scaffold readme on Github. Note: The app scaffold is for advanced web developers. Zendesk can't provide support for third-party technologies used in the scaffold, nor can Zendesk debug custom scaffold configurations or code. At the prompts, enter your name and email, the app's name, the URL of the file to be iframed (if any), and a folder name for the app. ZAF v2 apps are iframe apps. If you don't specify the URL to an iframe file, ZAT will create a basic HTML file that you can use in an iframe. You can start a local HTTP server and run your app locally. This ability is essential for testing and debugging your app. You don't have to package and upload the app to Zendesk Support first. This feature is supported in Chrome and Firefox, but not Safari 9 or later. To test your app locally, ZAT runs a local http server and loads the app in the Zendesk Support https page. This results in mixed content. Chrome and Firefox block mixed content but provide a way to turn off the blocking. Starting with version 9, Safari also blocks mixed content but doesn't provide a way to turn off blocking. Some features may not work locally. See ZAT server limitations. In the command-line interface, navigate to the folder containing the app files. Note: The command prompt is unavailable until you shut down the server later. Append ?zat=true to the ticket URL, and reload the page. Tip: Bookmark the modified URL for easy access in the future. You might also want to create a dummy ticket for app testing. 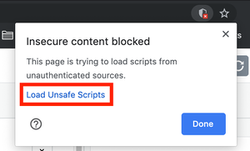 If you're using Chrome or Firefox and now see a shield icon in the Address bar, click the shield icon and agree to load an unsafe script (Chrome) or to disable protection on the page (Firefox). If you don't do this, the browser will block your app from being loaded into Zendesk Support. In Firefox, the shield icon is located on the left side of the Address bar. Click the Reload Apps icon in the upper-right side of the Apps panel to load your local app into the panel. 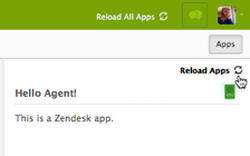 Even if the app appears in a Zendesk Support page, it's actually running locally on your machine. Note: If nothing happens, check for a shield icon in the Address bar. See step 5. Work iteratively to develop and test features in your app. For example, make some changes to your app's source code, save the changes, then click Reload Apps on the ticket page to test the changes. When you're done for the day, press Control+C to shut down the local server. When you're finished developing your app, you should run validation tests to catch any problems before uploading it to Zendesk Support. The ZAT validation tool runs the same tests that are run when an app is uploaded to the Zendesk App Market. When prompted, enter the URL of the Zendesk Support instance where you plan to install the app. The command doesn't actually install the app. Specify http instead of https in the URL. Example: http://yoursubdomain.zendesk.com. Fix any problems reported by the tool. When you're ready to upload your app to your instance of Zendesk Support, use the ZAT tool to package the app for uploading. 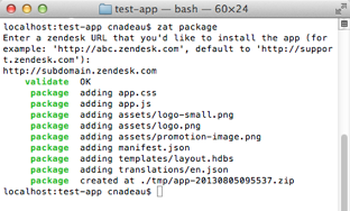 When prompted, enter the URL of the Zendesk Support instance where you plan to install the app. The command doesn't actually upload and install the app. Also, specify http instead of https in the URL. Grab the zip file (app-20130110164906.zip in the example) and upload it to Zendesk Support. For instructions, see Uploading. To get around these limitations, you can install the app as a private app and then use the zat update command to make updates to the installed app. See Updating an installed app. For other limitations, see also Zendesk app tools - Known issues. Indeed, this helps a LOT! Is it possible to pass the parameters in the "zat server" command, or even better, could the server be configured to read from an config file? Yes. From version 1.20.0 it will automatically read from a settings.yml file in your current working directory. Or you pass it a file with the -c option. Looks like the latest version of Ruby is 2.1.3. Will that work, or should we use 1.9.3 explicitly? I'm using the latest Windows install, which is 2.0.0p481, and it seems to work just like it should. I'm getting an error when I try to run "zat validate" or "zat package" ("zat new" and "zat server" work fine); I've tried it with Ruby 1.9.3 and Ruby 2.0.0. This is on Windows 8. Hi, I'm having the same issue as Jacob. Were you able to resolve it in the end Jacob? @Jacob Mattison - have you tried updating your ZAT to the latest version? Type: "sudo gem update zendesk_apps_tools" on your console. I have the latest version of ZAT -- I got the error within an hour of installing it, and just now tried to do the gem update and got "nothing to update". @Christopher Stock -- the error has not resolved. I was able to deploy my app by simply zipping up the directory and uploading it, but couldn't use ZAT for the validate or package steps. @Jacob Mattison - i think i may need to communicate directly to investigate further on your issue. Expect an email from me as i will be creating a Support ticket for you to have this issue resolved. Arthur, any updates on this? My gem is update-to-date as well. Running Ruby 2.0 on my Win8 box. I'm experiencing the same issues as Jacob (Validate and the Package commands throws and error). Hi again, after skimming through these topics, I found this, which helped tremendously! When I'm running zat server, is it also supposed to stop me from affecting the zendesk tickets themselves? For example, say my app has a button that changes the ticket status to "pending" and add a "we'll get back to you" canned comment. If I click that button while ?zat=true, then will it change that ticket in real life? Any changes made while '?zat=true' runs will be changed just like in real life. We recommend making a test account, populating it with test data, and experimenting on that. If you have any questions about how to set up a testing account, just let me know. Also, what are you making? I'm also not getting the Apps button in the upper right that is usually there, so I can't load the app. I'm running Mac OS X 10.10.5 and the latest version of zendesk_apps_tools. The Zat server is running from the app folder. But couldn't get my existing app to run through there. I guess I'll just try to start fresh and port stuff over until I can figure out what the issue is. Awesome article, Charles. Exceedingly clear and helpful. Thank you!! I know it's a bit late in the day, but here's the issue. Using the appropriate paths to your Ruby exe and Node JS exe files respectively. Help! I just updated my Ruby and gem packages. Warning: unexpected string encoding: IBM437, zat runs best in UTF-8. Please set the RUBYOPT environment variable to "-E utf-8". Hi, I've Installed Ruby version "ruby 2.2.6p396 (2016-11-15 revision 56800) [i386-mingw32]" (also tried latest version and 64-bits, but I see this one was recommended). The 'sassc' native gem requires installed build tools. https://github.com/oneclick/rubyinstaller/wiki/Development-Kit under "quick start" . Would probably be a good idea to update the docs here with that info. zat validate command it is showing below error. Same problem here. I can't get past this SSL error for update/validate/package. Did you manage to find a solution?